Waaistraat 5, 9000 Gent, Belgien. 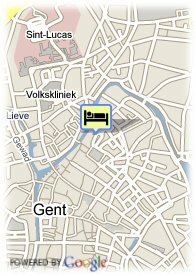 Ghent River Hotel is situated on the right bank of the Leie, which is beaconed the Ghent boarder between the 11th and 15th century. Thanks to the ancient pier, Ghent River Hotel is the only hotel that can be reached by boat. The site encompasses 2 buildings: a renaissance house, dated 1518 and a rice-mill built on a burnt down sugar refinery, dated 1857. The building also served as a cotton spinning-mill (1873), a warehouse (1879) and a steam actuated bakery (1892). Stadtzentrum, Museenviertel, in der Nähe der Altstadt, Fluss, in der Nähe der U-Bahn / Strassenbahn, in der Nähe der Einkaufszentrum. In front of the hotel you come across a small square which is served as thread (yarn) market in the Middle Ages and the 19th century. Next to the hotel we meet one of the typical medieval “waterstraatjes”. After a few minutes walk, you meet the ‘vrijdagsmarkt’ with the statue of Jacob van Artevelde. 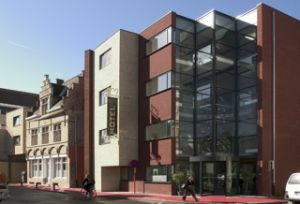 The hotel is situated in the center of Ghent and therefore all shops, musea,... are nearby. Our luxury B&B in Ghent is centrally located for business as well as for tourists exploring Flanders.